like boulders on the pencil of every designer. The name not only describes a Gran Turismo, a powerful and sporty front- engined car that is pleasant to drive, but ideal proportions, elegance, and a strong sports connotation at the same time. There are many examples, and perhaps they rank among the most beautiful, of cars that carry this name. Just think of the 1946 Cisitalia 202, the 1962 Ferrari 250 GTO or the 1965 GT SWB to understand it’s true meaning and importance. In June of 2015, when we decided to make a new car, I was immediately asked: “Can we make it beautiful?” The task was not easy despite the fact that the 427 Roadster, the one-off that we presented a few months earlier in Milan, had been met with enormous critical acclaim for its style. That project was born as a tribute - although revised in an “Italian” way - to overseas muscle cars, and was essentially a pure roadster. Nonetheless, we believed that abandoning what we had achieved stylistically on the first model would have been a mistake. In just a few minutes, I began to change its forms and make them not only more modern, but closer to the precise characteristics and proportions of a Berlinetta. From that moment on, our true journey began. Designing what we immediately decided to call “Berlinetta” was certainly not an easy task, but I think that is what fills us with pride the most. Designing the exteriors was the real challenge we faced. It was difficult work to balance the lines and proportions between the different sections that had to not only respect the heritage of the Roadster, but translate it into the new forms from a Berlinetta at the same time. The style has matured a great deal. Now, the design is so simple and elegant that it can accommodate elements with very strong character, and show pronounced muscles, without ever being detrimental to the overall appearance. A very long bonnet houses a powerful 8-cylinder engine, centrally mounted after the front axle, which allows us to have a short frontal overhang, accommodates the important distance needed between the front wheel arch and front pillar, and highlights the front of the car even more. The front has important openings for cooling the engine compartment, but as part of the evolution from the previous style, we provided two side air intakes that allow for the cooling of the braking system as well. This forced us to completely redesign the front itself, but it ultimately created a more streamlined and sporty look. The roof is very rounded and descends gently towards the broad and muscular rear, which makes the car feel as if attached to the ground. The body always brings with it two very distinctive elements in the two visible ribs that begin at the windshield and gain body as they move to the rear, on the sides of the rear window. For the top, we wanted to show the true soul of the magnificent car body that is built entirely out of carbon. The carbon mesh itself is left exposed, which, if viewed at a certain angle, shows off golden reflections - a stylistic gem that is totally customizable to the customer, who can even select the color of the reflections for the visible carbon elements. For the side, there was a need to increase the extraction capacity of the hot air in the engine compartment, and it created a strong, distinctive element that ultimately characterizes the side itself. Moving towards the rear, there were two important elements that had to blend harmoniously with one other: the shoulder that embraces the lower part of the frame and the side discharge. Both of these go far beyond being exclusively designed for style. For example, the changes made in the name of being aerodynamic have led us to accommodate a very pronounced extractor. Trying to hide it by using body-colored elements would have been the simplest and safest choice, but we strongly wanted to do the opposite. The design of the tail section even tends to highlight the technical beauty of an element that, although very sporty, manages to fit well with the elegant style of the other elements and is marked horizontally, deliberately in contrast with the vertically elongated optical groups. Every single detail embraces both a style and a function, blending the car’s technical peculiarities with a classical and modern stylistic framework at the same time. The Puritalia Berlinetta was an immense undertaking, not only on a stylistic level but a very technical one for a designer. A car of almost 1000hp requires a series of technical requirements that are often constraining for the designer. For me, this was an opportunity to create a new and innovative blend of engineering and style - and, on a personal level, it allowed me to push myself beyond previous limits. Designing the Puritalia Berlinetta was a challenge. A difficult, long, and demanding challenge; but without a doubt, a beautiful one. Designing a Berlinetta car means being heavily involved, no exceptions. On a technical level, it is a much more complex project than a rear-engine sports car. The presence of the transmission, in addition to all the technical difficulties it creates in terms of engineering, forced us to be incredibly thorough for an entire study of the interiors and their ergonomics. However, this ultimately resulted in the cockpit of the Berlinetta as a triumph of craftsmanship that embraces technology. The overall style is dictated by the central tunnel that functions as the “backbone” of the car interior. The rib that emerges represents the connection between the front heart and the rear wheel drive, a typical Berlinetta characteristic. 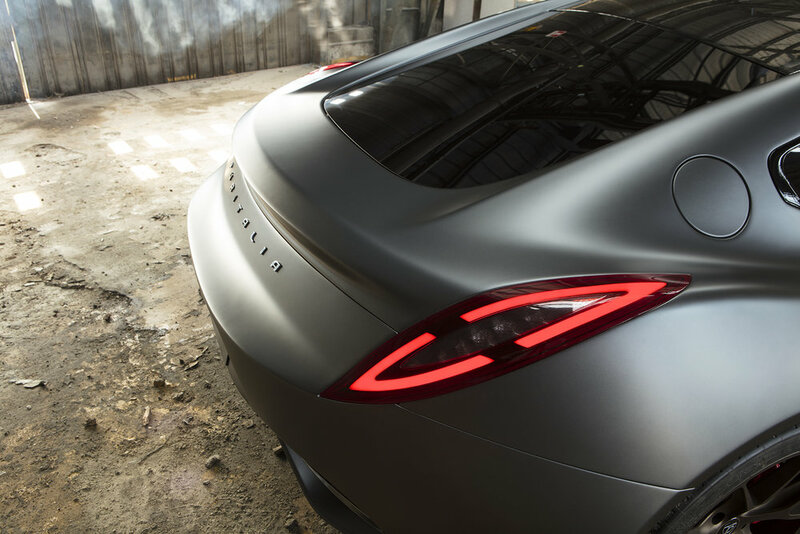 In this case, the connection is twofold: in fact, this concept was made to connect the two hearts that the Berlinetta hides under its fiber skin - the front thermal propulsion and the electric rear one. They’re two hearts that, at the touch of the driver, begin to show the true Super-Hybrid soul. The goal was craftsmanship that embraces technology, as we said. The impressive touch screen stands at the center of the dashboard, and the display in front of the driver is literally framed in a single piece of steel milled from a solid. The same fine workmanship has been used for all visible metal elements: the central joystick, the high console on the car ceiling, the buttons, the handles, and even the ventilation system. These are many small treasures, all set in an environment where fine leather and carbon form a contrast that is able to remain both luxurious and sporty.